If you are writing and posting content for your blog from time to time and very less people actually read it then you must be frustrated and turned down. Well in this case earning good income is far from possible. Bloggers or site owners at first don’t realize the importance of SEO. This is where everything goes wrong and eventually one quits the online business. If you don’t know the in and outs of SEO, then It is always better to have SEO experts work along with you when you are running an online business. This will keep you checked on every stage and put you in the right direction. After all, you want more visitors to come to your site and SEO experts exactly know how to make it happen. Search Engine Optimization consists of various steps and each of them is important to get to the top of search engine rankings. Below are some of the major SEO steps that you should take to enhance your site traffic and eventually become one among of the best sites on the internet. But remember SEO requires a lot of hard work and time. If you cannot manage all the SEO steps by yourself then consider hiring professional SEO services. Do not publish poor quality content on your blog. This can hurt you in many ways. First, your search engine ranking will suffer. Even if you manage to get some traffic in your blog, visitors will stay no longer than few seconds and never come back. This also applies to content that you publish on the directory websites to increase the traffic. Even though you are mainly focused on including links inside the articles or in the Author’s Resource Box you need to include quality content in them. Choose a niche that appeals to you. Do not get caught away by the success of your friends doing well in a specific niche. Your blog might not get the same recognition on the internet. It is good to choose a niche that you are interested in or passionate about. This will keep you focused while writing content and keep it unique on the internet. Also do not drift away from your topic of the blog. If you can manage this search engines will love you. What if you are working on a niche that is promising but not in your expertise? In this case, hire SEO services who are experts in the niche that you are working on. Many think that social bookmarking is a tedious task. But in fact it is not. One can make use of free social bookmarking services such as OnlyWire.com to bookmark the posts on the blog. This is a great way to quickly increase the website authority. Collaboration with other bloggers is also necessary to promote your blog. Building a network is necessary to promote each other’s blogs and generate powerful traffic. It is favorable for your site, if you can find partner sites that already have good search engine rankings. But it is important to choose the partners carefully and their sites should be relevant to yours. So, you have a great blog. However, it is not generating the traffic that you had hoped for. Well, there are some tactics that can help your blog get the exposure it deserves. You may be checking and rechecking the daily statistics of your blog to find out how much traffic it has attracted. Be that as it may, you can make use of the following tips to make a significant difference. Content is the most important thing about any blog. If you can consistently keep producing content of a high quality, you are bound to attain success in the long run. The content you post should be useable. They need to be profitable both for you and the reader. Content that can produce actions is preferable. This can include lists, podcasts and guides. Your content should be useable and relevant even after days and years have passed. It should certainly be relevant now but more importantly in the future. It will ensure that the traffic keeps coming. It may be slow but it will certainly be steady. Hot topics may bring you traffic immediately but it will dry up in the long run. Avoid making your content boring. A conversational tone can improve readability. A slight humor can be similarly effective. Your readers want to be entertained after all. Promoting the content will be essential to bringing in traffic. Even if you implement some basic SEO techniques, you will find that the effect is sizeable. Your readers will be greatly benefited if you include links to the related posts. These links can lead to the competition or the industry leaders. Make sure that the people know that you have mentioned them in a blog post. Many of them will share the post. You are not the only writer in a particular topic. There can be many other people blogging about the same thing. The bond that you create with other writers and your guests can prove to be immensely beneficial in the long run when you need favors like introductions and shares. Create this bond by sharing their content, posting valuable feedback and direct messaging. You can start writing up posts that are not promotional. Then link them back to your bio or website. These types of content can be posted on the smaller blogs at first and as your reputation increases you can start writing for the bigger ones. 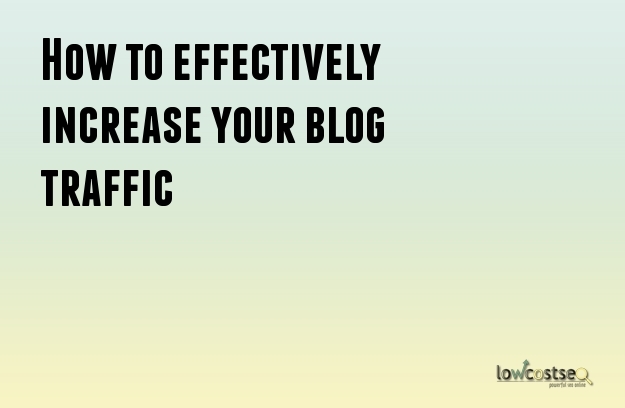 By linking back these posts to your own blogs, the traffic can be increased considerably. There are numerous social networks where you can create a group such as Facebook and LinkedIn. Form a group with other writers and make the group grow. Post content in the group and encourage the members to share them with their friends. It is easy to get discouraged when the results do not show up immediately. It will take time but ultimately, you will be successful if you are consistent. Are you on a lookout to bring in more traffic to your blog? Do you want a detailed study of the technique to gain more readers and subscribers? Creating the content for a blog is the most essential part of a blog. The content of the blog provides information. It is also crucial for the search engine optimization of the blog. However, till the time the blog becomes viral, various SEO techniques have to be applied to promote the blog. Each and every website owner faced this issue of increasing readership of their particular blog. These tasks sometimes lead to frustration. Readers do not read a blog for the sake of it. Certain strategies have to be employed to make the readers interested. A professional designer should be hired to design the blog. This will aid in highlighting those parts of the blog that are important and interesting. The professional blog designing ensures the blog to load faster and be more efficient. More than half of the users judge the quality of the blog on its design. The title of the content should be an attractive one. It will be the titles that are shown to the readers in the search engines, emails or social media. The majority of people determine whether the content should be read or not based on its headline alone. Commenting on the blogs of others will increase the number of visits because readers and other bloggers will be interested in what your blog has to offer. This may often lead to a reciprocated comment and creates good connections. Guest blogging is a very convenient to increase the amount of followers on social media accounts and other websites. You are more likely to get more inbound links if they have a blog. Then there is reverse blogging. Reverse blogging is a way to communicate with the bloggers who already have an extended number of followers. This is a quick method to increase traffic in a blog. It is very important to keep in touch with the bloggers who communicate with your type of audience on a regular basis. Marketers believe that content marketing has escalated the awareness of their brand. The members of your audience these days are highly likely to be users of social networking sites. Therefore, you should share links of your content on the different of your social networking sites. This will enable the blog to reach out to more people. Almost all marketers are known to use social media for their business. Frequently sharing posts with videos, infographics and presentations will make you an expert and this will increase traffic. People are always on the lookout for expert advice. Videos are more easily absorbed by brains than brain and is a good type of content for blogs. The blog should link to other relevant informational sources. Running a blog may seem to be too much of a hassle. However, with the right tips, you will find it easier to maintain a blog and increase your audience base.